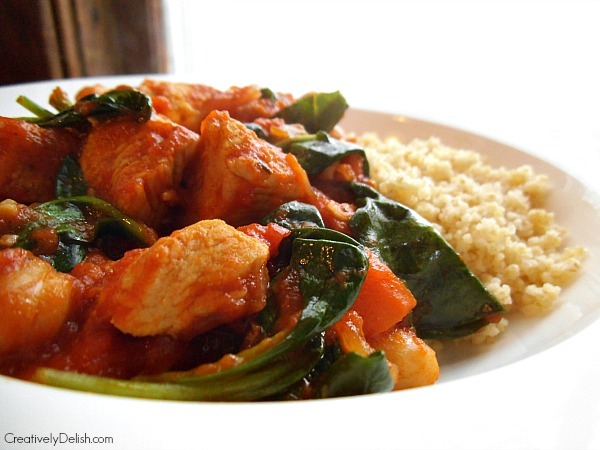 A Mediterranean style stew with simmered tomatoes, garlic, greens and chicken. 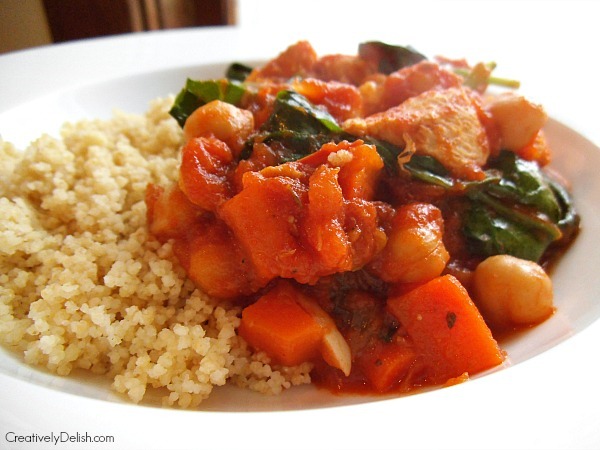 This is a simple, clean and healthy stew that takes no time at all to make and enjoy. Soups and stews are to winter as cold margaritas are to the beach. It's just perfect. Long ago stews were meant to cook for hours - that just isn't the case anymore. 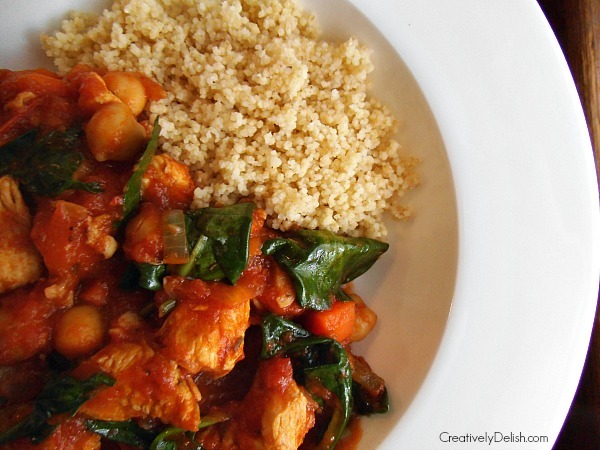 This simple stew is made up of clean and healthy ingredients - chicken, garlic, tomatoes, spinach and chickpeas, served over a bed of whole wheat couscous. Omit the chickpeas if you aren't a fan or sub in kale or escarole in place of the spinach if you prefer. I use fresh baby spinach, not frozen, to get maximum flavor. The carrots give it a little sweetness while the chicken and chickpeas make it hearty and full of protein and fiber. 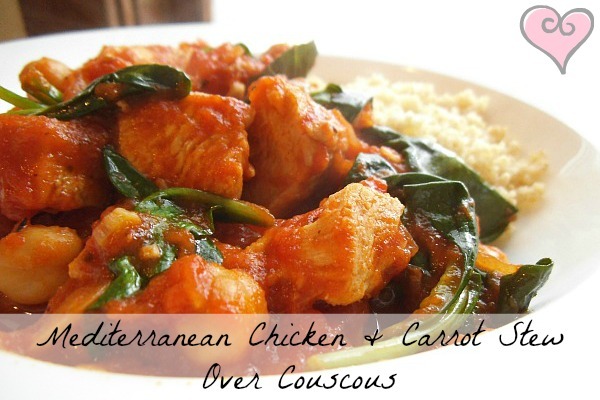 I cooked a big batch of this and stored some of it in the freezer - even the couscous. Couscous are basically little balls of pasta and is a very traditional food you might see on middle eastern plates. I used whole wheat couscous for added whole grains. If you want to be extra clean in this recipe, replace the couscous with pearled barley or farro. Either of these will give the stew a good consistency although the couscous will sop up any moisture from the stew so you don't waste any at all. Be sure to add in the spinach last otherwise it will become too wilted and loose it's flavor and nutrients. If you're on the hunt for clean recipes, you'll love this! It took me about 10 minutes of prep and 30 minutes of cooking and the couscous takes only 5 minutes to cook and fluff. In a large soup pot, heat oil over medium-high heat and add chicken, seasoning with salt and pepper. Remove chicken once cooked and browned. Add onion, garlic and carrots. Cook until onions have browned slightly. 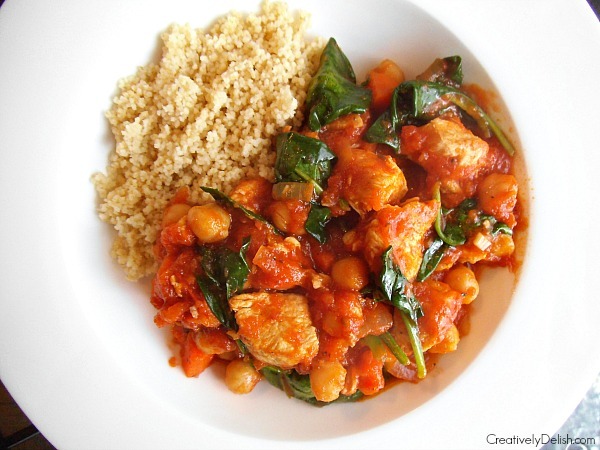 Return chicken to the pot and stir in tomatoes, oregano and chickpeas. Cover and simmer for 15 minutes or until the soup has thickened. In a small saucepan, bring 1 cup of water to a boil. Once boiling, remove from heat, pour in couscous, cover and let it sit for 5 minutes, fluff with a fork. Once the stew has cooked for 15 minutes, stir in spinach, letting the leaves wilt down slightly. Serve one cup of stew with ¼ cup couscous.